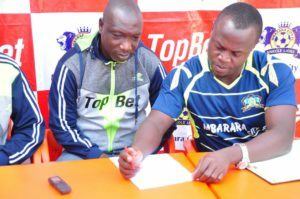 Mbarara City CEO Saddam Mugalu (right) signing on the one-year contract availed to Ibrahim Kirya. Courtesy photo. FOOTBALL–The former SC Villa, Lwaza and URA FC head coach has put pen to paper on a one year deal with a view of saving the club from relegation. This comes only two days after Kirya was relieved of his duties at URA FC sighting poor perfomance. By the time Kirya left URA, the tax collectors were in sixth position on the log, 11 points behind leaders SC Villa. The task that awaits him at Mbarara is immense considering the Westerners are are only two points off relegation with one fan to play in the first round. Mbarara is in 12th position with 16 points from 15 games. His(Kirya) first game will be against third from bottom Masavu at the Kakyeka Stadium in Mbarara and three points is the least that the fans expect from the team.